How will red meat perform Easter 2018? Easter is a key event in the retail calendar, not least for categories such as red meat. Last year we saw traditional cuts underperforming, so this year can they turn things around or will we see a continued break with tradition? Retailers tend to bring out their Easter range at approximately the same time each year irrespective of when Easter falls. Given that Easter 2017 was later than in 2016, sales of Easter categories took place earlier given a longer run up, the warmer weather last year also stunted sales on the Saturday before Easter weekend. There was generally less engagement across the majority of Easter categories compared to 2016, not least in the traditional Easter categories, including Easter eggs, hot cross buns and lamb roasting joints. Last year, in the four weeks to Easter, shoppers spent £177.2m across total fresh roasting joints* a fall of 8 per cent in spend on Easter 2016. 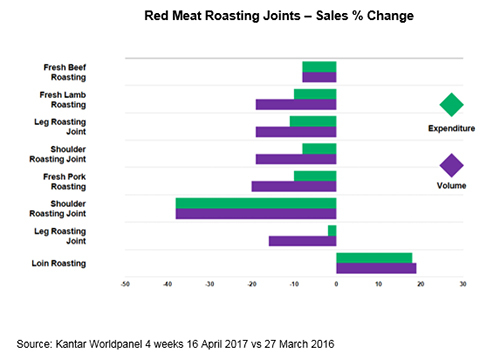 Red meat roasting joints were down 10 per cent in value and 16 per cent in volume, a significant decline at such an important time of the year. While shoppers bought lower volumes, the key driver of this decline was 918,000 fewer people buying into the market, perhaps driven by an 8 percent rise in prices. Across the board, volumes were down, with only fresh chicken and pork loin roasting joints bucking the trend. Fresh chicken’s success came predominantly from shoppers switching spend from all other proteins. Against a backdrop of a good Easter 2016, lamb joints struggled the most last year, with an 18 per cent decline in volume, losing £3m to other proteins. While shoppers left the roasting category across all of the proteins, lamb was worst hit, losing 805,000 households compared to Easter 2016. So, which were those households? The lost shoppers were more likely to be those already less engaged with the roasting occasion pre-family, younger and from smaller households. There was also a general move away from promotions, and with a reduction in promotional activity across almost all roasting cuts, most categories saw a decline in volume sale performance. This highlights the importance of promotions in driving engagement with the likes of younger shoppers. Fish and pork loin roasting joints were the only areas to grow sales while decreasing promotions, although fish’s performance relied heavily on price inflation, leading to existing shoppers spending more. Last Easter, around 55 per cent of all pork volume was sold on promotion, but that fell to just a third this year. Pork loin saw an even bigger drop, to less than 20 percent sold on promotion but, for its third consecutive year, it continued to see growth in value and volume, driven by more affluent shoppers. Overall, it appears that the decline in promotions led to fewer people bothering with their Easter roast this year. Cheaper options such as chicken performed well, while lamb perhaps became too much of a luxury for some. The stripping back of promotions has been seen across grocery but we can see that within some categories, especially at key events, they are vital in attracting shoppers and driving volumes. What can we expect this Easter? Easter Sunday falls on 1 April this year and, as we saw from 2016, the earlier Easter falls, the later shoppers buy Easter Categories. We can expect shoppers to delay purchasing until six weeks before Easter, with the last two weeks being key . With inflation still present in the market and real incomes starting to decline, this year shoppers may well continue to trade up in some categories, yet look at value options in others to keep Easter spend at a similar level to last year. Higher prices drove Easter performance last year, with fewer promotions hitting consumers and it is likely this climate will continue this year. While many shoppers tried to manage their spending, others did not buy Easter categories at all. Within Meat, Fish and Poultry, the increasing need for convenience is likely to continue to be a key theme at Easter as households look at ways to save preparation and cooking time over the holiday period. Finally, the weather may also have its say as a warm Easter does not usually bode well for roasting joints, as highlighted by the strong growth of sausages in April last year, due to a rise in barbecue occasions. On the other hand, the earliness of this year’s Easter weekend could work in roasting joints’ favour.